“What Remains of Bears Ears” – A Washington Post article. The Washington Post just published a great interactive article on the efforts to preserve Bears Ears National Monument. Last spring (2018) I was asked if I was interested in providing content for a museum exhibit to be show-cased in the John Wesley Powell Museum in Green River, Utah. The exhibit titled, “Glen Canyon: A River Guide Remembers” is intended to present the landscapes of Glen Canyon before it was flooded by the waters of Lake Powell. The exhibit is centered around the experiences of early river runner Ken Sleight, who was an outfitter running trips in Glen Canyon during the 1950’s, pre-dam era. Ken later used his experiences to become an advocate for the protection of these natural landscapes and associated cultural resources. I was asked by the museum staff if Hopi people have a connection to this region and if so, would I be willing to share some of that information to museum visitors? Of course I said Yes! Being a river guide myself, I have a deep respect for not only river running history, but also the natural and cultural landscapes that we travel through. It is often through personal experiences within these outdoor settings that individuals gain a very personal and emotional connection to these places. Hopefully out of these unique experiences, we all gain a deeper appreciation for these areas and continue to strive for their protection and preservation. After consulting with the museum staff about the overall message of the exhibit, I produced the following write-up, which is displayed next to a large photo of the Smith Fork Petroglyph panel that was completely covered by the waters of Lake Powell. The exhibit recently closed at the John Wesley Powell Museum, but is now being relocated to an empty art gallery located across from Ray’s Tavern in Green River. I was honored to be involved in this project and look forward to visiting the exhibit and hopefully running the Green River for the first time! Thank You to the museum staff for this opportunity! It is often these smaller museums that tell some of the more compelling and personal stories. If you are ever in the area, be sure and stop by the new exhibit location and check it out! Relocated location of the “Glen Canyon: A River Guide Remembers” exhibit. For Hopi People, Glen Canyon is recognized as part of a larger landscape that contains numerous connections to our ancestral past. This is ancient land of Hopi ancestors, the Hisat’sinom, “The People of Long Ago”. For millennia, Hopi ancestors lived in this region, inhabiting the sandstone mesas, canyons and river bottom. They were among the first to experience this unique landscape and call it Home. The tangible evidence of Hopi ancestors who lived in Glen Canyon is found within the archaeological record as artifacts; the metaphorical “footprints of the ancestors”. These include prehistoric villages, ceramics, lithics, groundstone, textiles and burials. 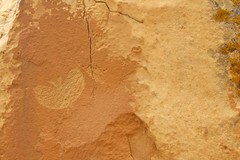 Hopi people believe these “footprints” were left behind as physical proof that our ancestors once occupied this region. Another connection exists in Hopi histories, songs and prayers that speak of landforms found in and around Glen Canyon; Toko’navi – Navajo Mountain, Namiqw-wunu – Rainbow Bridge, Pisis’vayu –The Colorado River and Yotse’vayu – The San Juan River. These places are associated with important events in Hopi culture. An ancient Hopi oral history details the adventures of a Tiyo, a young Hopi boy who floated down the Colorado River in a cottonwood raft, starting his journey somewhere within Glen Canyon, perhaps near Toko’navi. Hopi people claim that Tiyo was the first “river runner” in the southwest, centuries before Powell took his own journey. We keep this history alive, not just within our minds, but we know it is written upon the landscape. 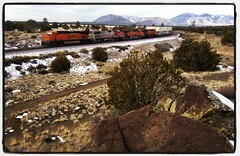 Museum exhibit photo of the Smith Fork Petroglyph Panel. 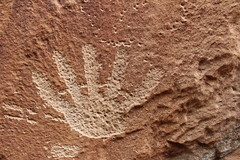 In modern times, Hopi people continue to visit the Glen Canyon area. We come seemingly as any visitor. We come to boat and fish in Lake Powell. We come to hike and explore. Yet we also come to pay respect to our ancestors. We recall the history of our people who once filled the canyons with their physical presence and spiritual essence. We know that among the sandstone mesas and canyons, and even below the waters of Lake Powell, there is a landscape that contains memories of Hopi history. Today when a Hopi person visits ancestral landscapes, we don’t simply see the remnants of a by-gone era, we see reflections of who we once were and what we have now become. We witness the artistic and technical accomplishments of Hopi ancestors, but we recall the spiritual accomplishments of our ancestors as well. Hopi People would like that the natural landscape of Glen Canyon be restored to its former beauty; hallowed ground that is alive with the spirits of the ancestors, who remain as spiritual guardians over a Hopi Cultural Landscape. Exhibit panels being installed in their new location. An investigative report by Reveal magazine stated recent sales in San Juan County include the “most archaeologically rich parcels ever offered for industrial use.” In 2015, the Obama administration deferred numerous leases in the area because of concerns over cultural resources. The origins of this book began as a session of the 2013 Society for American Archaeology conference held in honor of Hopi Cultural Preservation Office (HCPO) Director, Leigh J. Kuwanwisiwma (retired). The papers resulting from that session serve as the basis for the 14 chapters of the book. The authors include HCPO staff, Southwestern anthropologists, archaeologists and ethnographers. Other contributors include members of the Hopi Cultural Resource Advisory Task Team, a group representing the three Hopi mesas, villages, and various religious societies and clans. The “voice” of this latter group is present in every chapter of the book. They provide direct Hopi perspectives and knowledge to a wide range of issues involving archaeology, repatriation, language preservation, ethnography, and traditional farming practices, to name a few. The extent of this group’s involvement exhibits a significant change in the way Hopi chooses to collaborate with outside academic interests. This is not an easy task to accomplish. Hopi people, by our own historical experiences, have long held distrust of those who wish to conduct research on our culture. In the forward to a previous book, Bacavi: Journey to Reed Springs (Whiteley 1988), Leigh Kuwanwisiwma (then credited as Leigh Jenkins Honheptewa), writes, “Intruders are not welcome, especially if they come dressed as anthropologists.” (1998:ix). This suspicion is the result of over 400 years of one-sided interactions between Hopi people and Western cultures, more often at the exploitation of the former, while only benefiting the latter. Reversing this sentiment would require monumental efforts, by both sides, which I believe is illustrated within the chapters of the book. Hopi advisors offering insight on an excavated site. Regarding the books content overall, there is no need for me to review the book chapter by chapter; suffice to say that there is a wealth of information to be learned from these writings. Another review of the publication states, “This book sets a new standard for collaborative research and provides an important example of the Hopi people controlling their own representational histories” (quoted from the jacket cover). I do not dispute that perspective. However is that enough? Is this the holy grail of “how-to” books in working with Indigenous cultures? No, it is not. Nor do I believe it was meant to be. As such, I view these works as a step in the right direction for academic research about Hopi culture and history. I do have one, broad critical review, and that stands with the nature of the writing, clearly showing its bias as a result of a scholarly conference. At times the reader must wade through the academic mindset; anthropological theories and scientific data presented from the perspective of the well-versed researcher. That is my biggest concern regarding the information presented. Specifically, who is the intended audience? Those familiar with anthropological works of this type will find benefit. Can the same be said of the everyday Hopi individual who thumbs through these pages? Yes and No. For example, more than one Hopi cultural advisor has stated after attempting to read the book, “this was not written for us (as Hopi people).” What is the implication of that statement? From my perspective it means there is more work to be done. Within these chapters there are insights that the average Hopi reader will identify with. The presentation of Hopi history, concepts, and philosophies resonates quite clearly as provided by the Hopi voice. This is a defining aspect of the book, presenting research “by Hopi, for Hopi.” This intent at times gets cluttered with technical jargon, but there is no need to belabor that issue. This is no direct fault of the non-Hopi authors, for they are not Hopi. We cannot and should not expect them to be fully able to present Hopi ideologies and perspectives back to a Hopi audience. This is where the collaborative efforts of Hopi authors and advisors illustrate their ability to finesse the scientific information to fit within a Hopi mindset. At times easily, other times not. There has been and will be disagreement on how this is best achieved. 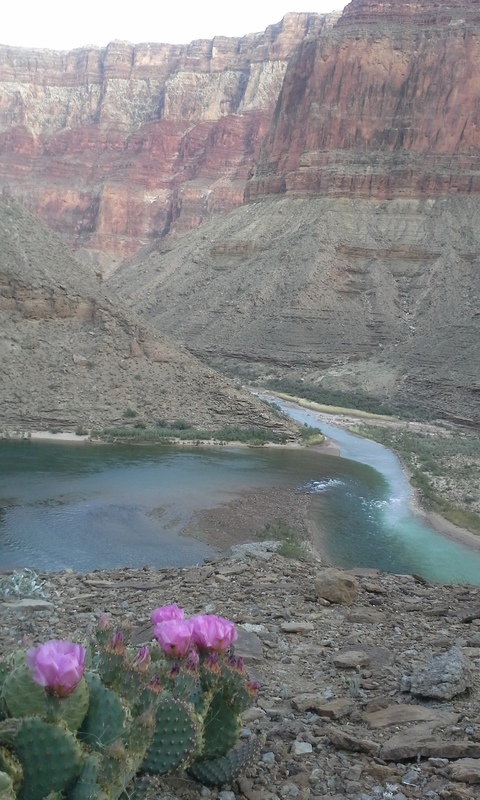 Hopis conducting monitoring efforts at South Canyon, Grand Canyon National Park. More importantly, we should not overlook the bridges that have been established through these types of collaborative works. The mere fact that this book even exists is a reflection of the effort put forth by both sides. Again, the focus should be on the willingness by Hopi cultural advisors, HCPO staff, and other Hopi individuals to become part of a solution that places Hopi research interests as priority. The various projects presented here represent well over three decades of those efforts through the HCPO. Each collaborative project builds on the preceding one, slowly increasing confidence in Hopi that the academics are sincere in their words, reflected through their actions, and ultimately their deliverables. It is acknowledged that Hopi is the driving force behind the decision to engage in research that was historically biased in the Western perspective. Hopi people, by nature, often deliberate cautiously. Decisions are not made in haste and require extensive discussion. Our longevity as a culture dictates that we do not always need to move at the pace of the outside world, which in reality isn’t so distant anymore. Yet as shown in these chapters, Hopi has not only learned to “talk the talk,” but “walk the walk,” in the realm of cultural resource management. Hopi is now looked upon by other tribes as a leader in the work between Indigenous cultures and outside research interests. At times it is a complicated task bridging these different sets of knowledge, requiring patience as the focused examination by Hopi moves line-by-line through management plans, research proposals, and other data sets. Returning to the statement of “this book was not written for us,” how do we address this? That I believe is the responsibility of Hopi. We are fortunate as a tribe to have a handful of individuals trained and experienced in cultural resource management. Some work for the tribe, others work for government agencies, private firms, and as independent consultants. It must be recognized that the works presented in this book have supported this reality, as many of us were trained through some of these projects and have moved on to assume larger roles and responsibilities in current endeavors. Therefore it is incumbent upon us, the Hopi involved in this work, to bring this information to the Hopi public. This work is also a reminder of a strong precedent set by Hopi. That is, any scientific research involving the culture and lifeways of Hopi ancestors, must include collaboration with their modern Hopi descendants. Those who chose to conduct their research in isolation do so at the risk of not only missing key Hopi perspectives, but also having their work viewed as one-sided—a step back into the biased history of Western research. Hopi recognizes this is a two-way dialogue. The current relationships established between Hopi and our non-Hopi counterparts need to be respected and encouraged by those who choose to carry on this work into the future. Black Mesa Archaeological Survey Crew, 2016. Photo by Michael Terlep. So where do we go from here? That is the work yet to be done. This book is not the culmination. Much like the epic clan migrations of Hopi ancestors, where each movement in that deliberate process resulted in an accumulation of knowledge for the greater good, the projects outlined within this book stand as metaphors—stepping stones to a greater understanding of Hopi culture and history. However, this goal must be inclusive of the Hopi public, for it is our culture and history, and ultimately it is we who must contemplate our next “migration.” In order to do so, we must continue to build upon the efforts of those Hopi individuals who were first brave enough to step forward as willing participants in a dialogue they were not well versed in. The value of the research within this book represents many things, the most notable being a direct acknowledgment of Hopi cultural intellect and sovereignty. We are the “experts” of our own history. As a new collective of Hopi “scholars,” cultural advisors, and community members carry on this work, these projects will reinforce the Hopi perspective that the meaning of the past is what it contributes to life in the present. In order to move forward, we must first understand where we have been. Ultimately, this book will be a testament of the respect and trust that is hard-earned and established between Hopi, and those who come dressed as anthropologists. 1988 Whiteley, Peter. Bacavi: Journey to Reed Springs (out of print). Forward by Leigh Jenkins Honheptewa. Northland Press, Flagstaff, Arizona. Origins of “Salado”. Graphic courtesy of Archaeology Southwest Magazine. In a few weeks, Ill be leading my first Archaeology tour of 2018. We will be examining the “Salado” Cultural Phenomenon in Southern Arizona & New Mexico. 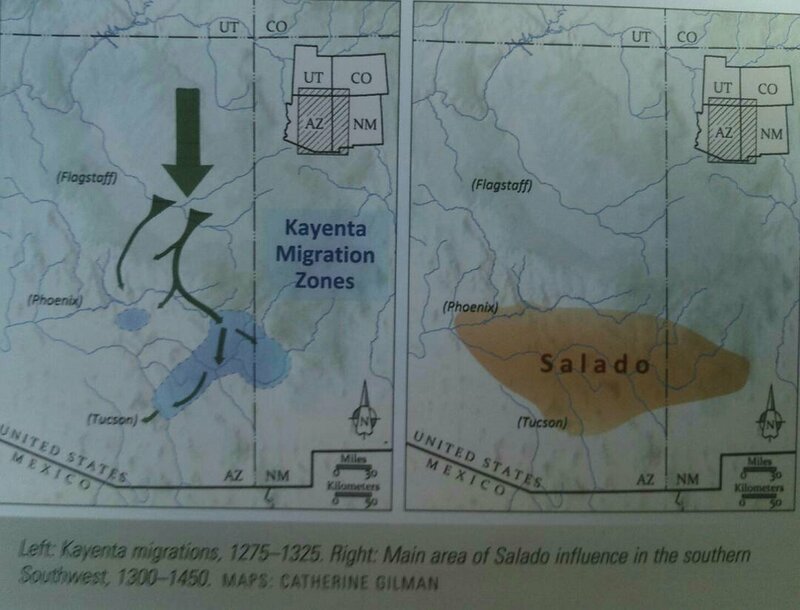 In short, the Salado Culture developed when Ancestral Puebloan migrants (i.e. Ancestral Hopi/Zuni) from NE Arizona & SE Utah migrated to points south during the end of the 1200s. 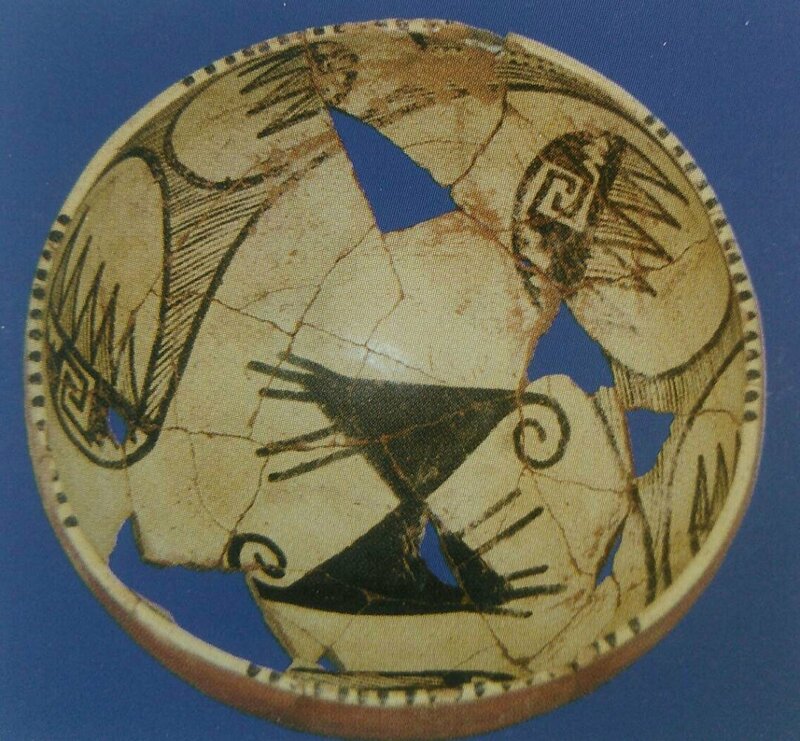 Over a 200 year time span this intermix of Northern clans with Southern clans produced a unique culture that included the development of an enigmatic ceramic type known as Salado Polychromes. When the clans of the Salado finally migrated back North, they moved to the Hopi Mesas and Zuni region. We can trace this movement through ceramic analogy, as well as through Hopi oral history, which talks of many Ancestral Hopi clans bringing cultural components from the Salado that are evident in modern Hopi Culture. Kayenta Bird Wing Design on Salado Polychrome bowl. 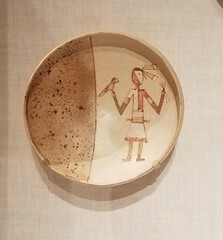 A diagnostic design of these ceramics is known as the “Kayenta Bird Wing”. First originating with the Northern clans, they carried this design south with them, where it was integrated into Salado Polychromes. This design, and other Salado influences, will be expressed in my jewelry leading up to this tour. I will also share bits of archaeological & cultural information about this phenomenon. So Stay Tuned! 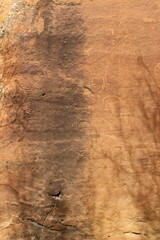 Hand Print & Sandal Design Rock Art, SE Utah. As part of a 3 day hiking tour of archaeological sites in the Bears Ears National Monument (BENM), I was asked to share a personal perspective based on my experiences as an archaeologist, outdoor guide and person of Hopi descent. When it comes to the Bears Ears, issues such as preservation archaeology, tourism and Indigenous perspectives all converge upon the landscape, setting the stage for conflict, but also collaboration. While archaeological research of the Bears Ears and Cedar Mesa regions is on-going, the study of Hopi connections to these areas and the associated archaeological cultures is currently limited and lacks detailed examination by Hopi advisors. I often pose the question of how is Hopi connected to these prehistoric groups from distant lands? What is the continuity between modern Hopi people (and other Pueblo groups) and the ancestral cultures of the Bears Ears? Seems like a valid question, given that the modern day Hopi reservation lies over 200 miles south of this part of Utah. What are the woven strands of culture that ties us back over time and space? I recall a prior conversation with a gentleman about the popularity of having one’s genetic background tested. Provide some DNA and you can see in neat percentages and cool graphics just where “your people” come from. There are a whole lot of people interested in learning more about their ancestry and heritage. Understanding your origins matters it seems. I wonder what my percentages would be if I were to be tested? Would my test results show a pie-chart with one solid color, labeled “Hopi”? In fact, just who am I as a Hopi person? Deeper into my family history there are memories of distant lands my ancestral clans occupied prehistorically. According to this knowledge, if I were able to conduct a DNA test of myself using archaeological culture designations, I would guess my Ancestral Puebloan pie-chart slice would be larger in comparison to the Mimbres, Salado and Sinaguan slices. These cultures being representative of various geographic areas my ancestral clans once occupied and therefore, I am of these places as well. Two Perspectives of Culture: Archaeological and Hopi (Graphic Courtesy Archaeology Southwest). Through a Hopi lens, the perspective of “prehistory” here in the Southwest is seen as fluid and dynamic. Rather than foreign concepts such as “Ancestral Puebloan” or “Sinagua” as predecessors to modern pueblo culture, Hopi sees Moti’sinom and Hisat’sinom; cultural concepts that encompass over 2,000 years of ancestry. According to Hopi oral tradition, many clans occupied the Four Corners area, including that of the Bears Ears and Cedar Mesa. These clans brought with them various sets of knowledge that would be incorporated into Hopi culture; ceremony, medicine, technology, language and arts. The end result being the development of what we now identify as “Hopi”. The tracing of that cultural evolution is reliant on both oral tradition and the tangible evidence found within archaeological contexts. Ceramic Spiral Applique, Circa 1100 A.D.
One Hopi perspective views the archaeological record as metaphorical “footprints” of Hopi ancestors, substantiating Hopi oral histories about clan settlements and migrations. Within Hopi culture is the belief that the meaning of the past is what it contributes to life in the present. This belief underscores the “cultural continuity” between modern-day Hopi and their ancestors. 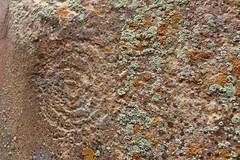 How this connection manifests itself, often daily, is in the cultural knowledge and traditional know-how a Hopi person maintains. This knowledge is evident in many forms within traditional Hopi culture; the crops we grow and eat, the homes we occupy, the tools we use, the art we create, the ceremonies we enact and the language we speak. All of which is really an accumulation of ancestral Hopi experiences, learned over countless generations. 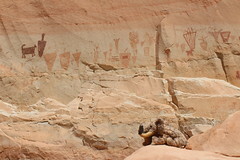 Based on this traditional view, Hopi people firmly believe that some of our ancestral clans are represented in the archaeological record of the Bears Ears. Parts of this ancestral history, the invisible strands of genetic code and the visible evidence of material culture, subsequently made its way into the modern expressions of Hopi people. Proving this requires continued consultation and fieldwork with knowledgeable Hopi advisors. Fortunately there are opportunities for future, collaborative Hopi research, including iconography found in textiles, rock art and ceramics, as well as discussions about agricultural traditions. One interesting area of study is the idea of return migrations or perhaps pilgrimages, by more recent Hopi people. 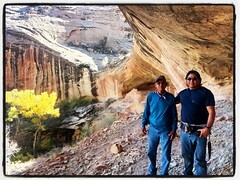 This is evident by the satisfying discovery of Hopi Yellow Wares on Cedar Mesa and surrounding areas. Faint “footprints” in the sand leading back into a recognizable landscape. This is the meaning that Hopi people find in the Bears Ears region. Experiencing ancestral sites within natural surroundings gives us both insight and reflection; insight into the lives of our earliest ancestors, and reflection on the migrations from Hisat’sinom to Hopi. Click HERE to access this, and other intriguing podcasts about Archaeology, Anthropology & Indigenous Issues. Thanks to the Archaeology Podcast Network for hosting the Heritage Voices Podcast! Hopi Tribe to Navajo Councilman Bennett: Let It Go! This episode is part two of the Grand Canyon National Park miniseries. Today we interview Heritage Voices co-host Lyle Balenquah, Hopi archaeologist, ethnographer, educator, advocate, and river guide extraordinaire about his background, diversity in Anthropology, and Hopi connections to the Grand Canyon. Grand Canyon topics include the proposed Greater Grand Canyon National Monument, the Desert View Watchtower project, river running, and diversity in interpretation. Recently I was asked to submit a review of this book for the publication, Kiva: The Journal of Southwestern Anthropology and History, which is published by the Arizona Archaeological and Historical Society. This is my unedited submission. Awat’ovi has experienced its fair share of research, both by the archaeologists’ trowel and the historians’ pen. Upon learning that a non-Hopi researcher had published a book about the Awat’ovi history, I had doubts regarding the intentions of such a book. Would it present new insights? Who among the Hopi community were involved in the research? Would it be another sensationalized account of the tragic events that occurred? More importantly, who was the intended audience? It is no secret the events at Awat’ovi are uncomfortable, unsettling and stand in stark contrast against what “Hopi” represents: cooperation, humility, nonviolent action and respect for all forms of life. It is a traumatic event that for many Hopi is viewed as a private matter; social healing from this history is an on-going process among the Hopi community. A review of this book requires an examination from a wider perspective of both the researcher and those being researched. Myself, being a person of Hopi descent with degrees in Cultural Anthropology and a subsequent career as a professional archaeologist, I have experienced both ends of the research spectrum. Admittedly due to these circumstances, I carry certain insights and biases with me. Ultimately, my review also takes into account the process in which the book was researched and produced. Mesa of Sorrows relies largely on previous research, including early Spanish documents, ethnographic and archaeological reports and to a very limited degree, insights from still-living Hopi people. As such, much of the book is spent on historical review, including early Spanish encounters with the Pueblo people of New Mexico and Arizona, and how this history influenced the Hopi attitude towards the Spanish. The Awat’ovi excavations conducted by the Peabody Museum in the 1930s also receive attention. This discussion of the archaeological record gives insight into how the Spanish altered Hopi material culture, including architecture, in their attempts to convert the residents of Awat’ovi. As an historical overview, this is the strong point of the book, especially for those who are new to the history of Hopi and Awat’ovi. It serves as a good jumping off point for those interested in pursing more about these subjects, with numerous references and footnotes to give direction. Brooks highlights a recurring theme in Hopi oral history, that being of external and internal strife that leads to division within the community, resulting in acts of contention, expulsion, violence, and in some cases, the taking of human life. Illustrating this theme, Brooks weaves together his research into a story that at times reads more like a popular mystery novel than a strict historical account. Brooks is no doubt a talented writer, avoiding use of academic jargon and theory allows the book to appeal to a wide readership. That being said, I found the retreading of previous research does little to present new insights, unless one is new to this subject matter, which I assume is the audience this book is intended for. The author’s inclusion of Hopi oral histories, many recorded over a century ago, only serves to highlight a glaring omission; that being the voice of the modern Hopi people who represent a “Living Culture”. This lack of a contemporary Hopi voice is a reflection of the level of consultation Brooks conducted with the Hopi tribe prior to the books publication. Again, in reviewing this book it is necessary to do so from the context of what defines “Informed Consent and Research” among Hopi and other Indigenous communities. The first notice the Hopi Tribe received of the books publication came through an announcement on social media. Subsequently, officials from the Hopi Cultural Preservation Office (HCPO) requested Brooks come present his book to the Hopi public, tribal officials and to the Cultural Resource Advisory Task Team (CRATT). CRATT is a long-standing advisory group comprised of knowledgeable Hopi elders from various villages, clans and religious societies. They provide consultation on a wide array of issues, including that of on-going scientific inquiry. In addition, the Hopi Tribe has in place its own established protocols of Informed Consent and Research. During this meeting, Brooks stated that he had previously sent a draft of the book to the tribe but did not receive a response. Granted at the time, tribal officials were embroiled in a much larger issue, that being the auction of Hopi religious and ceremonial items in Paris, France. Thus the social media notice of the books publishing came as a surprise to tribal officials. Although Brooks offered copies of his now published book to those in attendance at the tribal meeting, the gesture did little to reconcile the fact that many tribal officials felt that an important step in the consultation process was overlooked. Among tribal concerns is a precedent implied by this book, that tribal input should not be a priority for research conducted by outsiders (or “insiders” for that matter). The consultation process as carried out by the Hopi Tribe offers the opportunity for a collaborative effort between outside researchers and tribal members. It entails more than a simple “yes” or “no”, approval or denial of research projects. Meaningful consultation is a reflection of good-faith efforts to present research that has benefits beyond that of the researcher. For decades the Hopi Tribe has extended this hand of assistance, with varying degrees of success. If the author had approached the Hopi Tribe seeking consultation on this topic, would the tribe have objected? That is a possibility. Would the Tribe have offered ways in which to collaborate on the issue? Again that is a possibility. The generalized nature of this book misses a key opportunity to include contemporary Hopi thinking about Awat’ovi, instead presenting only a reiteration of already documented “facts”. Perhaps the author’s intentions all along were an attempt to side-step controversy by relying on what had already been printed about Awat’ovi. From the Hopi perspective, it is difficult to understand why one would choose to write about such a tragic event. By excluding modern Hopi perspectives, whether intentional or not, only proved to Hopi people that outside researchers feel they do not have to seek Hopi involvement. One undisputable truth remains, the Awat’ovi event is an extremely traumatic point in Hopi history, one that continues to affect Hopi people and is manifested psychologically among the Hopi community. These effects (i.e. Historical Trauma) are largely ignored within this book which does little in assisting the Hopi people towards healing from the Awat’ovi event. A point not overlooked or taken lightly by those who attended the meeting between the author and tribal officials. Note: the issue of “Historical Trauma” as related to Awat’ovi and other historical events is thoroughly examined in other publications, most notably, Moquis and Kastiilam: Hopis, Spaniards and the Trauma of History, Volume 1, 1540-1679 (Sheridan, et al, 2015). This body of research represents an on-going collaboration between the Hopi Tribe and scholars.